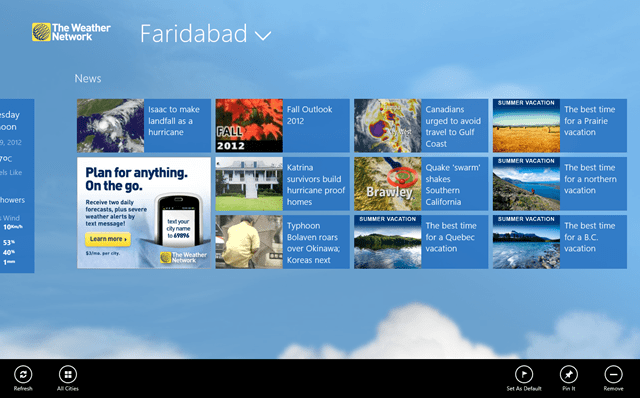 The Weather Network is a free Windows 8 weather forecasting app used for forecasting weather at your convenience and will report to each and every information about the weather in your city or your nearby region. 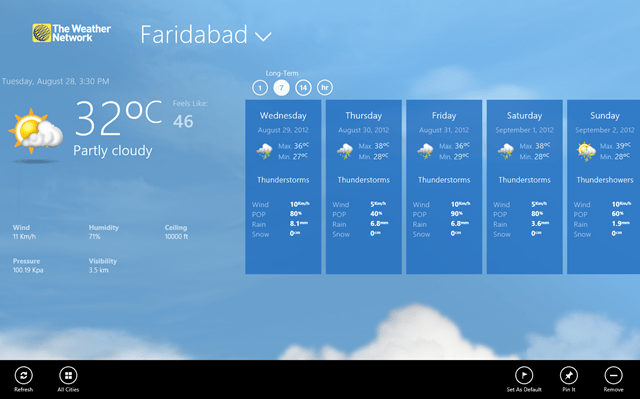 This is an amazing Windows 8 app that shows you all the aspects of weather in your region in various time duration. The app provides you with all the information regarding weather like the humidity and the maximum and minimum temperature also with the precipitation level. In addition, this Windows 8 weather app also provides you with a visual approach of the weather also with the wind speed and visibility. You can have the weather report on your fingertips and can view the report in short-terms, in hours or in weekly based measurement. It asks about your location and this app for Windows 8 takes care of everything afterwards. You can check out the weather report of Faridabad city in India. Similarly, you can view the weather reports of various other cities. You just have to add other cities that you want to view on your Network Weather App and the weather forecast is on your fingertips. Just click on the options above and you can change the duration in which you want to watch the report. So, here at this Windows 8 weather forecasting app, you can see all the enlisted cities with their related weather reports. 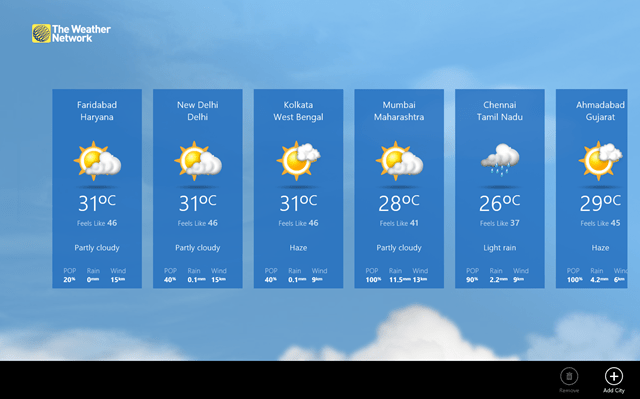 All above with the weather forecast, this weather app for Windows 8 also shows you the weather news of various places all over the globe. Just click on any of the news items and get all the information from other countries related to flood, drought, or any natural calamity. You can get each and every news related to weather here. So, download this little Windows 8 weather forecasting app on your Windows 8 desktop and stay informed.